I'm not the only one scratching my head at its omission from an ever expanding lineup of nut and seed butters. Fellow foodie (and Bar Method devotee) Diana, of Diana Takes A Bite, feels my pain, as evidenced by our recent Twitter exchanges. Search Google for "walnut butter" and you'll find a handful of online sellers and Amazon shops (see: Artisana and Fastachi), but mostly you'll find recipes and tips for making it yourself. Which is exactly what I did. You should, too -- it's easy, healthy and tremendously satisfying. All you need are walnuts, a food processor or blender, and maybe some sea salt, cinnamon and honey. I'll never long for commercially prepared walnut butter again. And, to be honest, this exercise proves there's no reason to buy jarred nut or seed butters, period. I made two batches, neither of which involved a recipe so much as tasting and experimenting along the way, so be prepared to be the same. There are worse things, right? The following quantities are approximations. 1. Heat oven to 350 degrees F and spread walnuts evenly on a parchment-lined baking sheet. Toast walnuts for about 10 minutes, stirring them around halfway through. 2. 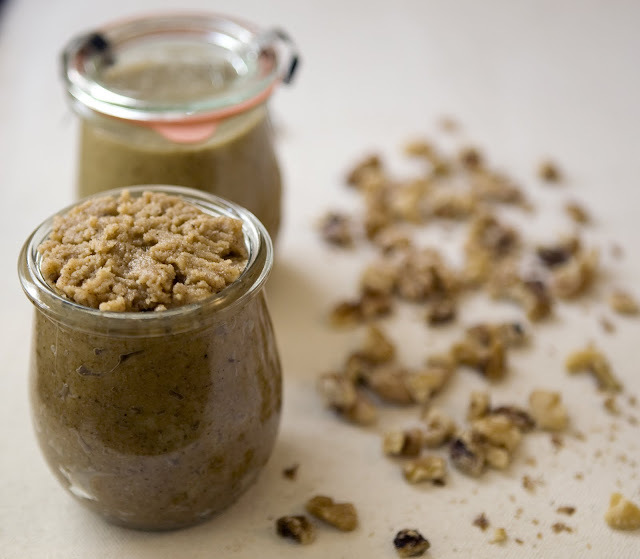 Allow walnuts to cool before transferring them to a food processor or blender. Add about 1/4 (generous) teaspoon sea salt and process until a butter forms, stopping the processor occasionally to scrape down the sides and bottom. Be careful not to over process, or the butter will quickly become a paste. Store the butter in an airtight container in the refrigerator. 1. In a food processor or blender, combine all ingredients and process until a butter forms, stopping the processor occasionally to scrape down the sides and bottom. Be careful not to over process, or the butter will quickly become a paste. Store the butter in an airtight container in the refrigerator. YES i've been wanting to make walnut butter! i hear adding cocoa powder makes it taste like broooownie batter. I've heard the same thing about cocoa powder, and am chomping at the proverbial bit to try it. Let me know when/if you do! Does walnut butter taste better than peanut butter?